As a landmark multi-use building which encourages business innovation in sustainable construction, the iCon Building in Daventry is a leading example of energy efficiency and sustainable building in its own right. Being such a high profile, eco-friendly construction project, material selection was a critical process. 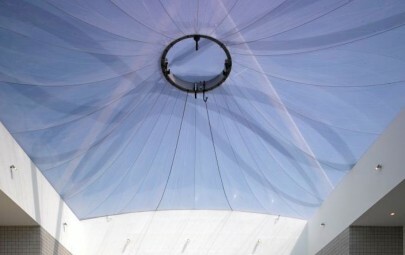 While light transmission was an obvious appeal, both glass and ETFE were considered as options. The choice to use ETFE foil as the roofing material was led by the low weight of the material itself and the reduced requirement for steel support structure in comparison to glass. 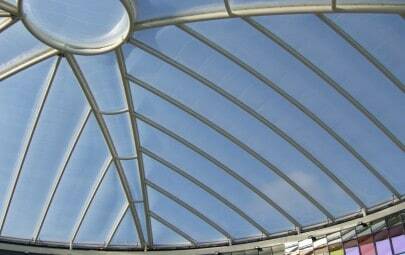 As well as the environmental considerations ETFE was chosen due to its ease of installation, cost efficiency and thermal qualities a three layer cushion can meet a U Value of 1.96. 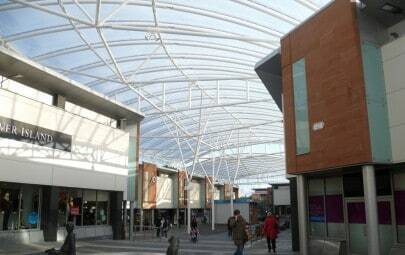 Also due to being fitted to timber, the ETFE cushions allowed for larger tolerances than a glazed roof. Low carbon design features including a natural ventilation system, exhaust air heat pumps and phase change materials in the ceiling also contribute to the performance of the building, resulting in a fabric first an energy efficient building, designed for stunning CO2 emissions of only 15kg/m2/year. The ETFE supporting structure is formed from glulam timber beams, bolted together to form 17 rectangular bays. For this type of installation, the connection between the glulam and the ETFE is critical and must be designed to take into account our specially designed tracking. To ensure an accurate interface detail on this project, we provided steel sections which were bolted to the beams to support the aluminium tracking system and ETFE cushions. For minimum visual impact, the air handling unit was installed within an internal plant room, with an external weather station located on the green roof to monitor changes in humidity, wind speed and temperature. The air inflation pipework was concealed within the flashings forming the perimeter of the roof. Due to the site layout and to the loadings on the concrete slabbed area below, which formed the roof of the car park, it was impossible to install the ETFE foil cushions using mobile access equipment within the structure. Nets were also not an option, as we could not attach anything to the Timber beams. In the end, it was decided that the only way around it was to erect a birdcage, which spanned between the two buildings and all installation works took place from this vantage point. Project Manager Mark Jenkins comments that “despite installation challenges, this was an extremely interesting project to be involved in which began winning awards long before it was even completed. Aside from being an architectural gem, this fantastic facilities building will play an important part in the regeneration and development of Daventry and surrounding areas”. The iCon Innovation Centre was presented with the Environmental Sustainability award at the East Midlands Constructing Excellence Awards 2011.